FOUNTAINHEAD 6 STAGE REVERSE OSMOSIS 100 GPD ALKALINE/IONIZER NEGATIVE ORP FILTER WATER SYSTEM - COMPLETE. ALL CLEAR HOUSINGS VISUALLY CHECK FILTERS. ALL PARTS FOR STANDARD INSTALLATION INCLUDED. Reverse Osmosis product water is more acidic due to it's purity. By the time the water is processed through the various stages, after the reverse osmosis stage, minerals etc has been removed. To replenish necessary minerals, an alkaline filter is recommended. 5th stage of this system is an alkaline/ionizer filter. The alkaline filter, the 5th stage in this system is recommended, as reverse osmosis product water tends to be acidic due to the purity of the water. All minerals have been stripped from the water. To buffer the water to a more natural alkaline state, and to add essential minerals back ie. Calcium, magnesium, potassium and sodium. We highly recommend the alkaline filter. This filter will increase the alkalinity without over correcting. This alkaline antioxidant filter provides abundant Active Hydrogen and also increases reduction power by increasing pH, making small water cluster and providing beneficial minerals. Negative ORP, which is produced with ionized alkaline water, severely retards the aging process. By counteracting oxidative damage to our cells. It does this by hunting down free radicals in our system and neutralizing them. Negative ORP is a very powerful anti-oxidant. And is found naturally in orange juice, glacial runoff and deep underground uncontaminated aquifer or spring water. Unlike electronic ionizers, which require a level of TDS (Total Dissolved Solids) in the water to conduct the current, our systems clean the water down to the ionic level, and then adds minerals back, before we filter the water through the bio ceramic ORP potential balls. 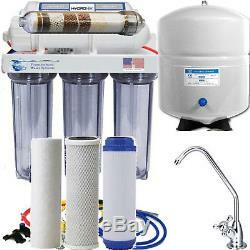 Reverse osmosis, also known as hyperfiltration, is the finest filtration available today. It is the most common treatment technology used by premium bottled water companies. It is effective in eliminating or substantially reducing a very wide array of contaminants, and of all technologies used to treat drinking water in residential applications, it has the greatest range of contaminant removal. Reverse osmosis will allow the removal of particles as small as individual ions. Reverse osmosis uses a membrane that is semi-permeable, allowing pure water to pass through it, while rejecting the contaminants that are too large to pass through the tiny pores in the membrane. Quality reverse osmosis systems use a process known as crossflow to allow the membrane to continually clean itself. As some of the fluid passes through the membrane the rest continues downstream, sweeping the rejected contaminants away from the membrane and down the drain. The process of reverse osmosis requires a driving force to push the fluid through the membrane (the pressure provided by a standard residential water system is sufficient - 40 psi+). Since membranes are subject to degrading by chlorine, iron, manganese, and hydrogen sulfide, and to bacterial attack, a sediment pre-filter and an activated carbon pre-filter and/or post-filter is included with your reverse osmosis system. RO systems are generally the best choice for water contaminated with high nitrite levels as might be found in agricultural areas. This unit contains the following. 1 SEDIMENT FILTERS 5 MICRON 1 GRANULAR CARBON FILTER 1 CARBON BLOCK 1 MEMBRANE 100 GPD 1 INLINE ALKALINE/IONIZER FILTER CLEAR HOUSING 1 INLINE POST CARBON FILTER 3 CLEAR FILTER HOUSINGS 1 MOUNTING BRACKET 1 AUTOMATIC SHUT OFF VALVE 1 FLOW RESTRICT0R 1 RO STORAGE TANK 3.2 gallon with 2.8 gallon capacity- 9" X 15" 1 RO FAUCET 1 FEED WATER VALVE 1 DRAIN SADDLE VALVE 1 CHECK VALVE ON MEMBRANE HOUSING COLOR CODED TUBING FOOD GRADE FDA APPROVED. ALL PARTS NEEDED FOR A STANDARD INSTALLATION. 1st Stage - All of our sediment filters use multi-gradient spun polypropylene filter cartridges. These cartridges use the entire depth of their media by trapping the largest sediment particles on the outside of the filter, then gradually stepping down the size of particles they will reject as the water moves closer to the core of the filter. The result is longer filter life, greater dirt-holding capacity, higher flow rates, and remarkably low pressure drop. The 100% pure polypropylene media is highly resistant to bacteria and chemicals, making this an excellent choice for both well water and municipal water treatment applications. 2nd Stage - Carbon is a substance that has a long history of being used to absorb impurities and is perhaps the most powerful absorbent known to man. One pound of carbon contains a surface area of roughly 125 acres and can absorb literally thousands of different chemicals. Activated carbon which has a slight electro-positive charge added to it, making it even more attractive to chemicals and impurities. As the water passes over the positively charged carbon surface, the negative ions of the of the contaminants are drawn to the surface of the carbon granules. 3rd Stage - With carbon block filters, water is forced through the pores of the densely compacted carbon block, where a combination of mechanical filtration, electrokinetic adsorption, and physical/ chemical adsorption take place to reduce a wide range of contaminants. Solid Carbon Block technology can reduce chlorine, taste and odor problems, particulate matter, and a wide range of contaminants of health concern -- cysts (cryptosporidium and giardia), VOCs (pesticides, herbicides, and chemicals), certain endocrine disrupters, Trihalomethanes (cancer-causing disinfection by-products), heavy metals (lead, mercury), turbidity, MTBE, Chloramines and asbestos. Solid carbon block filters do not remove healthful, naturally-occurring minerals. Sodium Sulfate Calcium Potassium Nitrate Iron Zinc Mercury Selenium Phosphate Lead Arsenic Magnesium Nickel Fluoride Manganese 85 - 94% 96 - 98% 94 - 98% 85 - 95% 60 - 75% 94 98% 95 98% 95 98% 94 96% 96 98% 95 98% 92 96% 94 98% 96 98% 85 - 92% 94 98% % may vary based on membrane type water pressure, temperature & TDS Alkaline/Ionizer Negative ORP Filter - The alkaline filter, the 5th stage in this system is recommended, as r everse osmosis product water tends to be acidic due to the purity of the water. To buffer the water to a more natural alkal ine state, and to add essential minerals back ie. Post Carbon Filter - A final Polishing step that ensues a sparkling clean and pure water taste. The feed water valve can be either the saddle valve or the feed water adapter depending on the model. Personal checks may be held until cleared. We do not mark merchandise values below value or mark items as "gifts" - US and International government regulations prohibit such behavior. The item "Reverse Osmosis Alkaline Ionizer Neg ORP System Clear Housings 100GPD" is in sale since Tuesday, July 2, 2013. This item is in the category "Home & Garden\Home Improvement\Plumbing & Fixtures\Water Filters". The seller is "fountainheadwatersystems" and is located in Cedar Park, Texas. This item can be shipped to United States, Canada, United Kingdom, Denmark, Romania, Slovakia, Bulgaria, Czech republic, Finland, Hungary, Latvia, Lithuania, Malta, Estonia, Australia, Greece, Portugal, Cyprus, Slovenia, Japan, China, Sweden, South Korea, Indonesia, Taiwan, South africa, Thailand, Belgium, France, Hong Kong, Ireland, Netherlands, Poland, Spain, Italy, Germany, Austria, Israel, Mexico, New Zealand, Philippines, Singapore, Switzerland, Norway, Saudi arabia, Ukraine, United arab emirates, Qatar, Kuwait, Bahrain, Croatia, Malaysia, Brazil, Chile, Colombia, Costa rica, Dominican republic, Panama, Trinidad and tobago, Guatemala, El salvador, Honduras, Jamaica.